Verity Montague is a servant in 1692 Salem. Her flaming red hair and mismatched eyes make her a prime target for accusation of witchcraft. Orphaned during the Indian raids, she and her brother with Asperger's Syndrome come to live with the key historical figures of the trials - The Putnams. They keep their synesthesia secret - that days, months and years appear as color in Verity's mind, and for John, that symphonies play in a Fantasia-style performance of colors and geometric patterns. Truman Johnstone 's ability to discern people's expressions, and decipher if they were lying - made him an outspoken child. Being different kept him from being adopted till he was fourteen. He now runs an orphanage for problem youths, and is a feeding therapist in his desire to help children deal with their peculiarities. To give them the childhood he never had. The harvest festival corn maze Truman creates every year has an unwelcome visitor. Children hear disembodied voices skipping through the corn maze amid the backdrop of eerie orchestral music. In every year of the calendar, intermittent doors of time swing open and closed, so long as the cornfield stands. In societies set on sameness - all are outsiders. They learn the traits that make us outcasts, may be the very ones that make us great, and that true love may heal all, and even transcend time. Normally I start my review with comments about the book, but I wanted to start this one with discussing the narrator. Karen Krause deserves kudos as she was perfect with Verity’s British, Truman’s Scots, and Rom’s Indian accents. She never fell into stereotypes, instead infusing each character with a unique and strong voice. She did a great job. Now, to the story. I have great admiration for authors who tackle either historical or paranormal books. Brynn does both and does it well. Verity Montague is trying to survive living in Salem, Massachusetts circa 1692. With her mismatched eyes and odd brother (whose Asperger’s was considered to be the devil’s work). The book opens with a high tension scene that sets up Verity and the direness of her situation. With her scenes being written in the first person, there is an immediacy to her story. When the story flips to Truman in the present day, told through the third person point-of-view, it lets the listener know things are changing. The pacing slows as we learn about this man whose chosen vocation is working with children with Asperger’s. This important job gives this former orphan a sense of purpose. The final POV is John’s, Verity’s brother. His mind is clear, even if he isn’t able to communicate clearly, and his scenes are just as terrifying as he faces an uncertain fate during the witch trials. Truman and Verity’s synesthesia differentiate them from those around them. For Truman, in addition to having the ability to see the colored auras surrounding people, words have tastes to him, and he has a built-in lie detector. These abilities, I believe, make him more open to accepting the impossible. Like communicating with a woman from another century. Verity is Truman’s impossibility. A young woman desperate to save her brother. Her love for John is strong as she feels protective of them because they are orphans, dependent on the kindness of strangers. Truman is the answer to her prayer, even if his world is beyond her comprehension or understanding. For Truman, Verity’s name tastes like snow – pure and refreshing. He never hesitates to do everything he can to rescue this ethereal figure. I only know Salem by reputation and Arthur Miller’s “The Crucible.” Brynn’s evident research brings that time period to life for me. That Verity can see through time and space intrigues me. I loved learning more about synesthesia, a condition has always fascinated me, and her understanding of Asperger’s and other disorders was well-done. This book pulled me in from the beginning, held me intrigued through the time travel, and kept me breathlessly hoping for a happy ending. Definitely an enjoyable book for lovers of history, the paranormal, time travel, and – above all else – love. I received this free from audiobookdotcom for an honest review. If you could sum up Where Bluebirds Fly in three words, what would they be? Three words to sum up "Where Bluebirds Fly" would be fantastic, intriguing, and amazing! This was a very well written story. Verity was my favorite character but I enjoyed them all. I really liked the role she played in the story. Parts of the story were very detailed and a few times I lost track of the characters as it moved back and forth but with that being said, I thought this was a fantastic audiobook. I thought Karen Krause did an OUTSTANDING job with this audiobook. There was everything to like about her performance. Very impressive. Listening to this audiobook was relaxing to me. I will look for more books by Brynn Chapman. 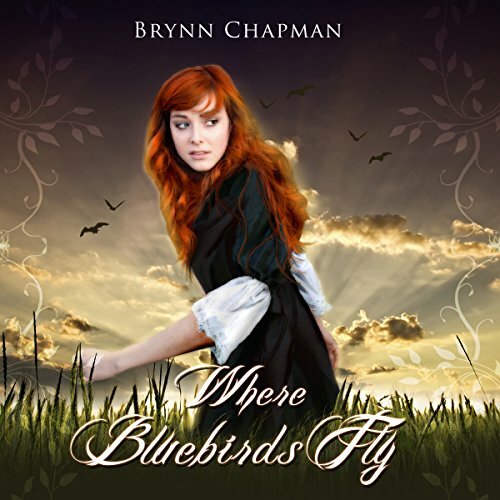 Where Bluebirds Fly is a unique and educational story about sensory disorders written by Brynn Chapman. It kind of threw me for a loop because I was expecting a supernatural story set during the Salem witch trials. What I got was an explanation for why some people see things differently than others and which probably caused mass hysteria back in 1692. The story centers on Verity who was orphaned with her brother John, both of whom become servants for a prominent family in Salem - the Putnam’s. John is described like someone with Asperger's Syndrome (think Sheldon from the Big Bang Theory), and Verity sees auras (colors and geometric patterns). Our hero Truman also suffers from a condition that gives him the ability to tell if someone is lying. Truman lives in present-day Pennsylvania helping his best friend run an orphanage for special children with “gifts” similar to what Verity and John experience. Truman and Verity meet with the assistance of a magical corn maze. Apparently, the maze is on a type of wormhole that periodically opens a time portal to Salem. The basic theme in the story is that true love heals all wounds - and may even transcend time. Karen Krause did an excellent job narrating the story. She gives each character their own distinct voice and seamlessly switches between genders and characters with ease. A well written tale by an author who is obviously very knowledgable about Aspergergers and it's manifestations. However, for me, it was not any easy listen, the different tenses and time periods caused me to lose the thread a little too easily, and I never did quite understand the secrets of the corn maze. For me, the story did not lend itself well to audio. This is simply a personal thing, obviously my mind doesn't cope easily with shifting time! However, because I felt the story to be compelling, I do have the book on order from my library. This book must have been an awesome task to narrate, but Karen Krause did the job and did it well. Her navy blue and silver voice mastered the differences of time, gender, age and accent, worth listening to if just for that. Loved this book! Romance, suspense, danger, and time travel. Can't wait to read the next! "I was provided this audiobook at no charge by the author, publisher and/or narrator in exchange for an unbiased review via AudiobookBlast dot. it was definitely a different type of book and very good. i only read part of the summary so when somethings started happening in the book it was very unexpected but i liked that. After I was half way through this book I checked out the authors website and realized she has a background in pediatric therapy and has hands on experience with individuals with Asperger’s syndrome. The author also did a great job of researching the times in Salem during the witch trials. Chapman did a wonderful job of moving back and forth between characters and time making the story flow together nicely even when switching within the same chapter. I did find this book to be a bit more scientific or I guess you one could say medical/technical. I didn’t have a hard time following it through as I already have a good understanding on Asperger’s. I did learn more about Synesthesia, which the author explained through the characters. Truman and Verity both were strong characters and I really enjoyed them. It was like a match made in heaven but between different times. I found both to be very technical in personality which reminds me of my own son. I am not sure how one without a knowledge of Autism would do understanding this story, it may be a bit too much for some. For this being the first audio book I have listened to, I found the narrator to be good at changing her voice for each character. At first I was lost with the accents for Truman and his co-worker, Rom at the orphanage but once I kept listening it became very easy to know who was who. I found myself at the beginning needing to pay close attention to the narrator to learn each characters accent and which place the story was talking about but it did become easier as the story went on. My attention was held well with the narrator, she has a soothing voice. The storyline hooked me right from the beginning so I wanted to know more and find out how this story would end. One of my favorite parts is when Verity and Truman communicate through Truman’s journal. I was very happy that this book wasn’t left with a huge cliffhanger. I look forward to book 2 and see what is in store for Verity and Truman within the cornfield portal.